View More In Laser Levels & Accessories. Find level and customize angles with more confidence and functionality than ever before. 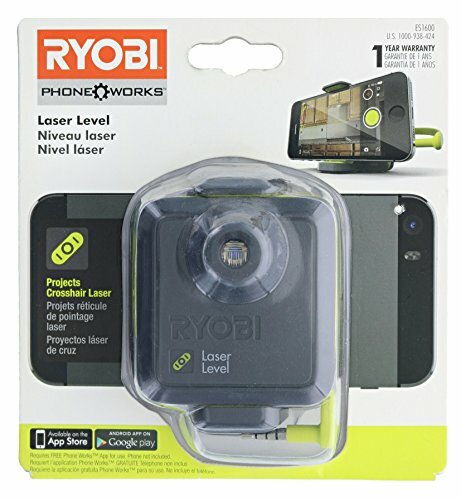 The cutting-edge Ryobi Phone Works mobile app and Laser Level device harness the power of your smartphone to produce level lines and much more. The device uses your headphone jack to project a crosshair laser line, and the free app transforms your phoneâ€TMs screen into a digital display of your project. The high-definition display shows measurement data and allows you to match and customize angles. When you have the data you need, the app lets you capture, store and send data/images for an easier way to manage your projects. Nowâ€TMs the time to upgrade from laser levels that only project lines. Get more functions, get more confidence with the Ryobi Phone Works Laser Level and mobile app. Store the Laser Level and other Phone Works tools in the storage case (Sold Separately). Ryobi Phone Works Transform your phone into your smartest tool.